Apple revealed details of its redesigned 15-inch MacBook Pro on Tuesday, including a new unibody construction, far more powerful NVIDIA graphics, Display Port output, a new glass touchpad with multitouch gestures, and a revised appearance with similarities to the iMac. 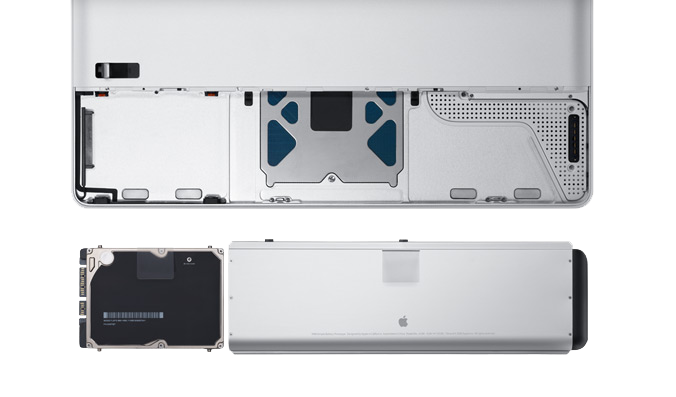 Apple detailed a new "unibody" construction method for the MacBook Pro that improves upon the current model's thin aluminum shell, reinforced with an internal frame. 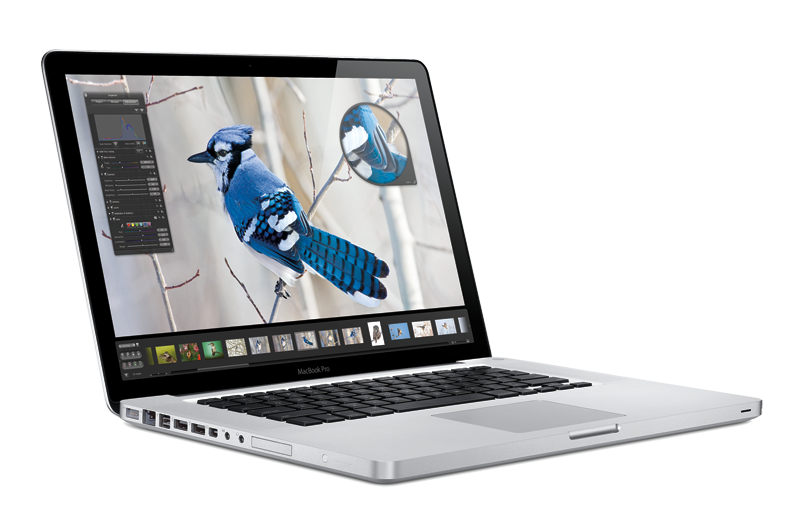 The new design is patterned after the MacBook Air released in January, although it appears similar to the MacBooks. The new construction employs half the structural parts of the former "discrete" MacBook Pro design but provides a case that is stronger, torsionally rigid, 5.5 pounds light, and 0.95 inches thin. It features a MacBook Air-style keyboard recessed into the frame. All I/O ports are located on left side, including: MagSafe, Gigabit Ethernet, Firewire 800, Dual USB 2.0, Mini Display Port (HDMI could not drive a 30" display), Analog/digital audio in and out, ExpressCard 34 slot, and a side-mounted battery indicator light. 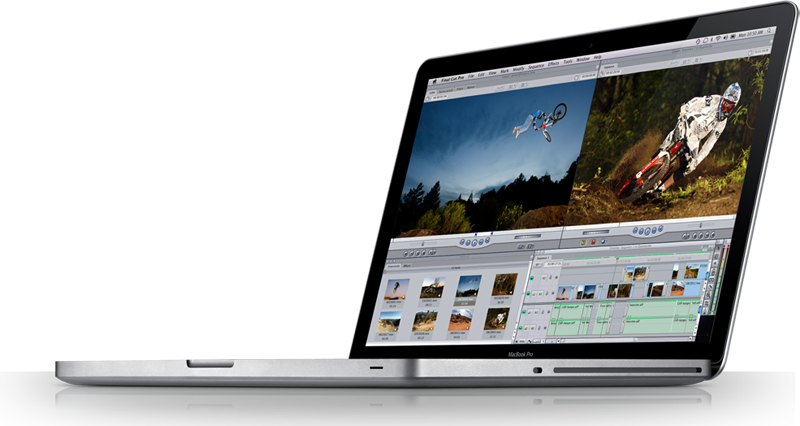 The MacBook Pro includes a new NVIDIA graphics architecture which combines a NVIDIA CPU-supporting chipset and graphics processor on one die. Originally designed for desktops, Apple worked with NVIDIA to develop a mobile version for the MacBook Pro, the company said. This new technology allow users to switch between the NVIDIA GeForce 9400M integrated graphics processor for better battery life and the more powerful NVIDIA GeForce 9600M GT discrete graphics processor for higher performance. The GeForce 9400M integrated chipset has 16 parallel graphics cores, delivers 54 gigiflops of graphics performance, while the 9600M GT has 32 cores and 125 gigiflops of processing power. The 9400M is rated for 5 hours of battery, while the 9600M GT provides 4 hours. The graphics chips also power a new "instant on" 15.4-inch LED display that is 30 percent more efficient with brighter, high intensity colors. The new battery cover provides easy access to the hard drive bay, which supports both a standard mechanical hard drive and a new solid state drive option. Locking the system with a security cable also locks the cover on the battery and drive. The MacBook Pro's new side-mounted battery indicator light means users won't have to turn the machine upside down to see the status of their notebook's battery if the machine is not powered on. The optical drive is located on right edge. It provides a DVD burner but does not support Blu-ray. Jobs said "Blu-ray is a bag of hurt. I dont mean from the consumer point of view. Its great to watch movies, but the licensing is so complex. Were waiting until things settle down, and waiting until Blu-ray takes off before we burden our customers with the cost of licensing." Meanwhile, the new MacBook Pro will continue to supply a backlit keyboard, sudden motion sensor, stereo speakers, iSight camera, mic, and now supply a magnetic latch like the MacBook Air rather than a physical latching mechanism. The new design features rounded, tapered edges without the series of screws that hold the top bezel to the frame as in earlier designs. There are several screws on the bottom of the machine, however. Both new MacBook Pro configurations are shipping today.